In the coming years, wind power will be a visible form of energy generation in over 27 states and several Canadian provinces. BlueSkyWind, L.L.C.’s (“BlueSkyWind”) strategy is simply the creation of distributed wind energy projects and small cluster wind farms wherever suitable wind, land use and avian issues permit. We seek places where the electrical infrastructure is in place and where supplemental energy is needed and cost effective. BSW will consider urban, suburban, industrial, farm and rural settings for wind projects. Originally founded in 1995 as a land use planning and development company, BlueSkyWind’s focus changed in early 2001 due to its interest in the field and stronger wind turbine technology which improved the industry worldwide. BlueSkyWind a privately held Limited Liability Company is striving for a leading role in this segment of the industry through the use of wind turbines ranging in sizes from 30kW to 1.65 MW in name plate capacity. 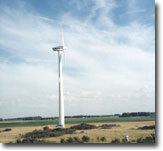 BlueSkyWind is specialized toward the development of onsite wind-powered generation in North America. BlueSkyWind positions wind turbines in windy industrial sites, commercial office parks, public and private schools, resorts, universities, hospital properties, water treatment plants and wherever there is a combination of strong winds and costly energy rates. Although like a large wind farm, distributed energy projects often have as many development steps, they differ in the land area required for placement. These projects can be placed within the confines of a company’s property boundaries. Subject to zoning, turbines can be placed well within city boundaries where power generation is most needed. As a result, BlueSkyWind will reach a goal of over 1000 megawatts of dispersed wind power before 2010. By creating energy generation in this manner, BlueSkyWind will be producing energy around the clock somewhere in North America. As a full service developer of wind projects we will bring together all aspects of a project including operation and maintenance programs once the wind turbine is up and running. Your site will be matched with the right size turbine to your entity’s energy requirements. We can also assist your own project development by providing site selection skills, wind resource assessment, governmental and environmental review and permitting, project financing and construction management. Wind power will contribute to managing our expanding energy requirements through a long-term cost effective, cleaner and more efficient process than what is available today. Wind energy is an intermittent form of power production which unlike other methods of power creation emits no harmful by-products such as mercury, carbon dioxide and other airborne pollution during the energy production process. Also important, wind turbines do not use water for cooling purposes. Unlike coal, natural gas or nuclear power generation wind energy will not create soil and water contamination where the energy is produced.